During his recent guest hosting gig on Wendy Williams' daytime talk show, Nick Cannon became a fan favorite. Not only was he embraced by Wendy's regular audience, but some of her staff reportedly wants him to take over full-time. Right now, Wendy is said to be "scared" that she might lose her show. As always on the program, there was tons of drama going down. One of the more buzzworthy moments came when Nick Cannon was speaking about Bhad Bhabie and how she scored a new makeup deal. He chose to compare the young rapper to Kylie Jenner, admitting that he would rather his daughter turn out like Bhabie than Kylie. During the show, he called out Jenner for having plastic surgery at the age of fourteen. He says that Bhad Bhabie may have a "bad mouth" and need some guidance but that all of that is fixable. Later on, he spilled even more tea when he slid into the comment section of his own Instagram post, responding to a fan who asked why he didn't just say he didn't want his daughter to be sleeping with an adult at fourteen years old. Of course, Kylie Jenner was romantically linked to Tyga for a long time before she turned eighteen. "Pretty much," replied Nick. "You knew where I was going!!!" 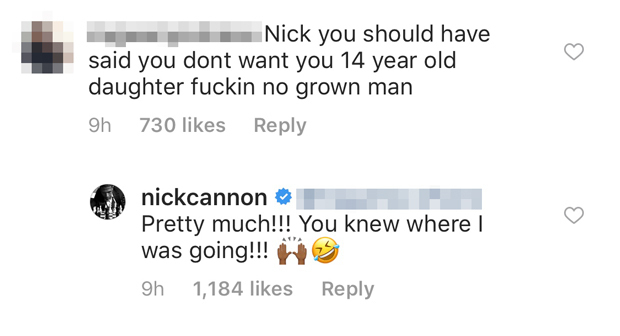 Nick Cannon has been making headlines for his controversial statements as of late but you can't really blame him this time. Would you rather your daughter end up like Bhad Bhabie or Kylie Jenner?